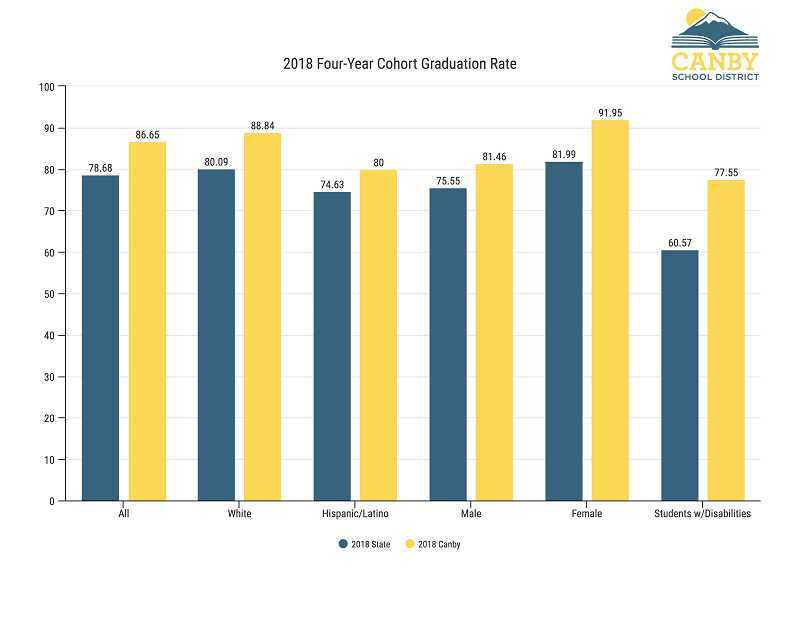 Canby's overall graduation rate remains higher than Oregon's rate, even after seeing a slight dip over the last two years, according to the latest graduation data released by the Oregon Department of Education. The rates for historically underserved student subgroups are up and down. Canby's graduation rate for all students is down to 87.4 percent in 2018 from 88.5 in 2017 and 89.8 in 2016. This still sits well above the state's graduation rate of 78.7 percent, which is up to the highest ever. These graduation rates refer to the percent of students in a cohort who graduated with a standard Oregon or modified diploma within four years. Unfortunately, underserved races and ethnicities continue to graduate at a lower rate in Canby. 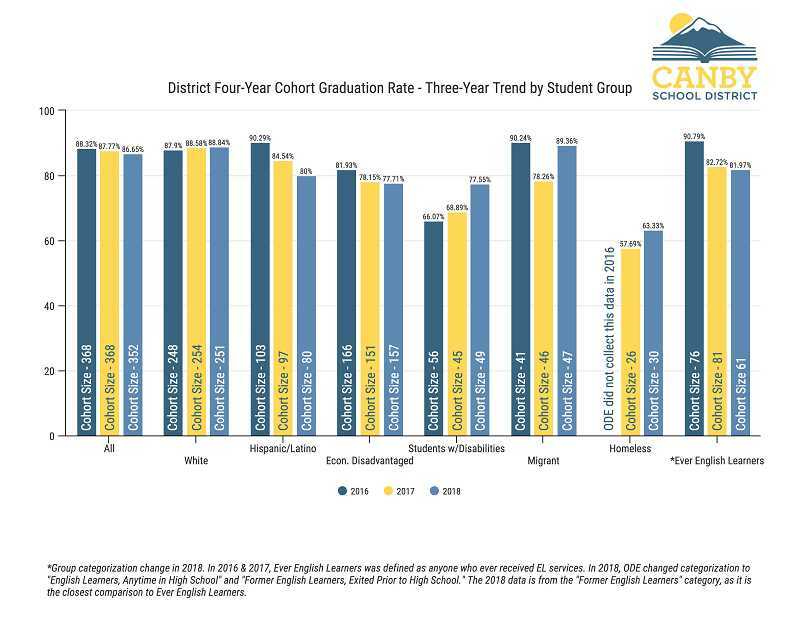 Canby's graduation rate for Hispanic/Latino students was down to 81 percent from 86 percent the previous year, and the rate for all underserved races/ethnicities dropped to 81.7 percent from 85.9 the previous year. According to Superintendent Trip Goodall, this data helps the district see where work is needed. "When we disaggregate the data, we get a better picture of where we need to concentrate our efforts," Goodall said. "Our goal is that 100 percent of our students graduate and that race, ability or circumstance does not dictate whether a student can achieve that goal." Canby did see improvement in the percent of students with disabilities who graduated on time. This rose to 79.2 percent in 2018, which is up from 72.1 percent in 2017 and nearly 20 percentage points above the Oregon rate of 60.6 percent. "While a large majority of our students are succeeding, it's up to us to identify and support those who are not," Goodall said. "Each staff member in our district is committed to the success of all of our students. We hope our strong partnerships with parents and improvements in attendance will increase the number of students who graduate on time as they prepare for college, career and life." Among efforts that the district has put in place through Measure 98 funding is the High School Success Team. This team is implementing interventions to remove barriers to success, according to the school district. Additionally, the district's "Cougars Achieving Together=Success" intervention program, which previously served Canby High students who failed a class at CHS, now extends to ninth-grade students who are identified as struggling as of eighth grade. Finally, to help more students graduate on time, the district is focusing on attendance. Research shows students who are chronically absent (those who miss at least two days a month) are less likely to graduate, per the district. So Canby High staff is working closely with at-risk students and their families to encourage regular attendance. Even district elementary schools are working to encourage regular attendance. For more information on how families can support student attendance, visit Every-Day-Matters.org; and for more on Canby's graduation data and statewide data, visit ODE's website.